Five Hundred In Cumberland; Conference Tomorrow For Further Use of WPA. Baltimore. March-23 A-total of 905 WPA workers are engaged in clearing away the mud and debris of last week's floods, Major Harry D. Williar, Jr., deputy state administrator for the WPA, reported today. "We expect the clean-up work to be through in a few days,” Major Williar said. 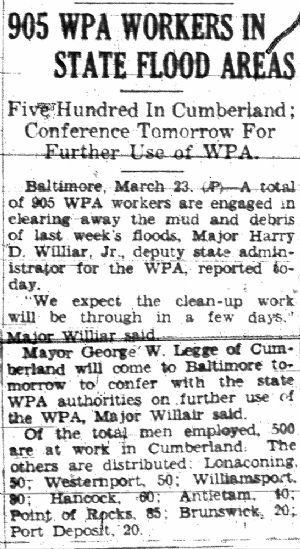 Mayor George W. Legge of Cumberland will come to Baltimore tomorrow to confer with the state WPA authorities on further use of the WPA, Major Williar said. Of the total men employed, 500 are at work in Cumberland. The others are distributed: Lonaconing, 50; Westernport, 50; Williamsport, 80; Hancock, 60; Antietam, 40; Point of Rocks, 85; Brunswick, 20; Port Deposit, 20.